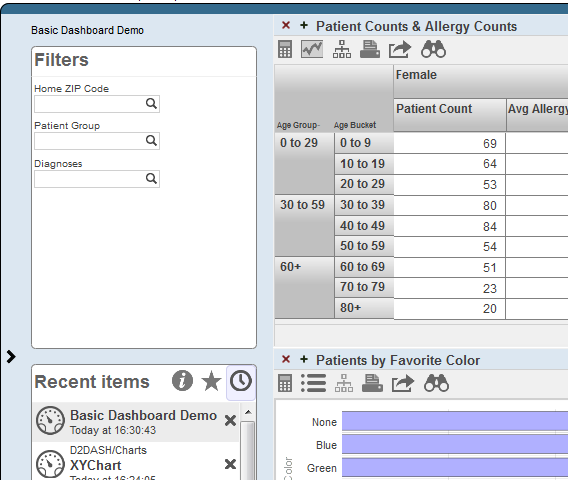 For information on customizing covers for dashboards, see the Using Dashboards and the User Portal. When you access the User Portal, the system displays that user interface as you last saw it. When you display a dashboard, the system displays that dashboard as you last saw it. For information on this option, see “Specifying Basic Settings” in Implementing InterSystems Business Intelligence. Note that there is a separate autosave feature for the Analyzer. Note that this name is used (along with Folder) as the logical name of the dashboard; the system displays this logical name when you use the Save As option, for example. The Dashboard Editor. For an introduction, see “Modifying Dashboard Settings,” later in this chapter. The Menu. For an introduction, see “Adding a Widget to a Dashboard,” later in this chapter. Display the dashboard as described in “Accessing Business Intelligence Dashboards,” earlier in this book. Note that even if the dashboard is not marked as public, you can access it via Main > Open. Also, you can find it in the User Portal by using the Find option. See the Using Dashboards and the User Portal. Owner  Specify the InterSystems IRIS™ user who owns this dashboard. If a dashboard has an owner, then only the owner can specify the Resource option for the dashboard; see the next item. Resource  Specify the resource that is used to control access to this dashboard. See “Visibility of Folders and Folder Items,” in the chapter “Using the Portal Features” in Using Dashboards and the User Portal. Category  Specify the category to which this dashboard belongs. The User Portal uses this to group items in the Covers View. See the Using Dashboards and the User Portal. Display the dashboard as described in “Displaying Business Intelligence Dashboards,” earlier in this book. The system then displays a wizard where you select a widget and specify basic information for it. 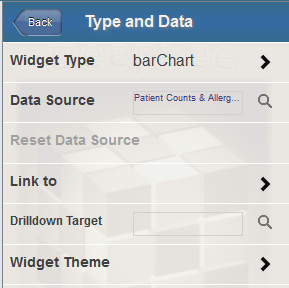 Data Source  Select the data source for this widget. See “Names of Data Sources” and “Kinds of Data Sources,” later in this chapter. Link to  Select another widget on this dashboard to use as the source. See “Linked Widgets,” later in this chapter. The system then displays a list of the widgets in the dashboard. When the toolbar is enabled, the system displays it if the widget is configured with any buttons or any controls that require it (but see the Show Maximized option). If the widget has none of these, the system does not display the toolbar. When the toolbar is disabled, the system never displays the toolbar. Show Maximized  If this option is ON, the system displays the toolbar only when the widget is maximized. The system then displays the Type and Data submenu. 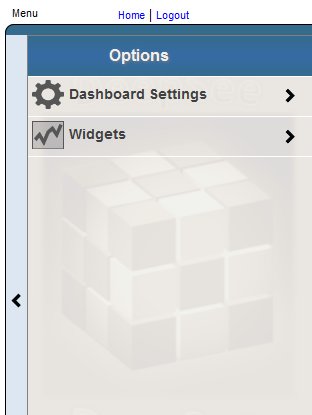 Note that the Widget Type option enables you to choose a different widget subtype; it does not let you choose a type. See “Widget Types and Subtypes,” earlier in this chapter. Display the dashboard that contains the widget. See “Displaying Business Intelligence Dashboards,” earlier in this book. Specify Folder, Widget Name, and other options. For information, see “Adding a Widget to a Dashboard,” earlier in this chapter. For information on the other options, see “Modifying Dashboard Settings,” earlier in this chapter. When you delete a dashboard, the system moves it into a folder named $TRASH, which the User Portal does not display. The User Portal does not display private dashboards. To delete a private dashboard, you must change it to be public and then delete it; see “Modifying Dashboard Settings.” Or delete the dashboard in the Folder Manager, which displays all items (both public and private); see “Introduction to the Business Intelligence User Interfaces” in Introduction to InterSystems Business Intelligence.